Abstract: We describe concept and implementation of a wiki-based application facilitating knowledge transfer and learning within the enterprise. Building on two interviews with managerial experts responsible for the roll-out and an online survey of 59 non-executive employees targeted by this new solution, we present the results of our evaluation. Our contribution was highly motivated from the continuing discussion on the potential and pitfalls of Web 2.0 technologies and applications underlying technology enhanced learning and the lack of empirical studies in contrast. 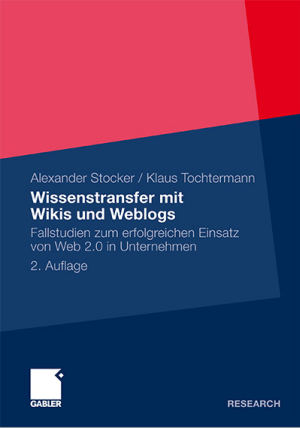 Stocker, Alexander; Granitzer, Gisela; Tochtermann, Klaus: Can Intra-Organizational Wikis Facilitate Knowledge Transfer and Learning? An Explorative Case-Study, in: Proceedings of eLBa – eLearning Baltics, Rostock, Germany, 2009.